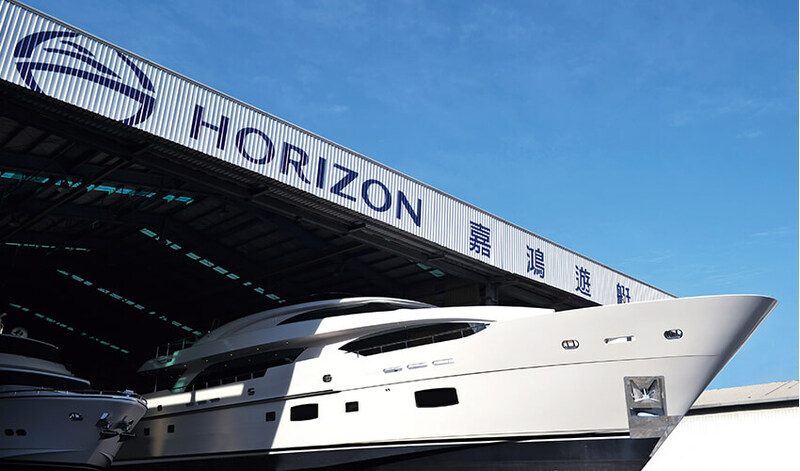 Horizon Yacht is the original company was co-founded by John Lu, Mr. Gong Shan Chiai, and Mr. Cheng Shun Hui in 1987 and is the headquarters for the Horizon Group. Through the years, Horizon has grown to encompass 463,000 square feet and employ 300 staff and craftsmen focused on building Horizon yachts from 60 to 130 feet (18-40M) in length. The Horizon models include luxury motoryachts, power catamarans, explorers, fast displacement motoryachts and custom megayachts built to DNV (Det Norske Veritas), BV (Bureau Veritas) or Lloyd’s Register class. Certified for meeting ISO 9001 standards through DNV, the Horizon shipyard houses fundamental yacht manufacturing equipment and systems as well as two test tanks and a water shed for yachts under 130-foot (36M). This facility also houses our 5-axis router and CNC milling department, which ensure the best and most accurate molds possible. The 5-axis router runs and works at a speed of 1,800 inches per minute; the router is able to stop at any precise position within a 0.01 tolerance, creating forms that are almost perfectly symmetrical and remarkably consistent. Via a comprehensive E-system, Horizon can efficiently manage and control the yacht construction progress as well as inventory, administration and a detailed record of customer service. Through technology-based management, the shipyard can effectively integrate a variety of resources to efficiently build premier luxury yachts with a high level of customer service. The main Horizon facility is also home to numerous internal departments such as the mechanical engineering development center, which staffs 20 engineers with master’s degrees and 90 full-time engineers. Also on site is the company’s interior design center, business administration and human resources; global marketing center; IT and systems departments and management offices.